“The Gaza Freedom Flotilla: Framing the Narrative.” By Amy Goodman | Democracy Now! They called it “Operation Sea Breeze.” Despite the pleasant-sounding name, Israel’s violent commando raid on a flotilla of humanitarian aid ships, which left nine civilians dead, has sparked international outrage. The raid occurred in the early-morning hours of May 31, as the six vessels laden with humanitarian aid were still in international waters, bound for Gaza, where 1.5 million Palestinian residents are in their third year of an Israeli-imposed blockade. Israel has, from the outset, sought to limit the debate over the attack, and to control the images. 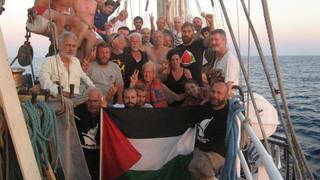 Israeli military boats and helicopters raided the vessels and took control of the flotilla. Nine of the activists on board the largest vessel, the Mavi Marmara, were killed at close range by Israeli commandos firing live ammunition. Nineteen-year-old U.S. citizen Furkan Dogan was shot once in the chest and four times in the head. Israel commandeered the six vessels and arrested the roughly 700 activists and journalists, hauled them to the Israeli port of Ashdod and kept them out of meaningful communication with family, press and lawyers for days. The Israeli government confiscated every recording and communication device it could find—devices containing almost all the recorded evidence of the raid—thus allowing the state to control what the world learned about the assault. The Israelis selected, edited and released footage they wanted the world to see. Four days after their capture, most of the detainees were deported by the Israeli government, well after the story had been framed. I caught up with two veteran journalists who were covering the Gaza Freedom Flotilla for Australia’s Sydney Morning Herald, chief correspondent Paul McGeough and his photographer, Kate Geraghty. They were in Istanbul, where they had been deported from Israel. They had spent time on most of the ships of the flotilla, but were aboard the smaller, U.S.-flagged Challenger 1 when the raid occurred. McGeough and Geraghty and all the other journalists have yet to receive their laptops, cameras, videos, photos and other possessions from the Israelis. And Israel has said it will not accept an independent investigation of its raid. Israel’s continued attempts to hide the truth only further imperil the security of Israelis, Palestinians and all those working for a just peace in the Middle East.